There are so many remarkable sights around the globe for you to discover. Let us show you why the world is such an incredible place as you explore its diverse landscape, iconic cities and natural wonders. *Terms and conditions apply, please review at the time of booking. To be eligible for bonus Qmiles offer, Privilege Club members must register by 18 September 2018 or at least 24 hours prior to travel, whichever is earlier. 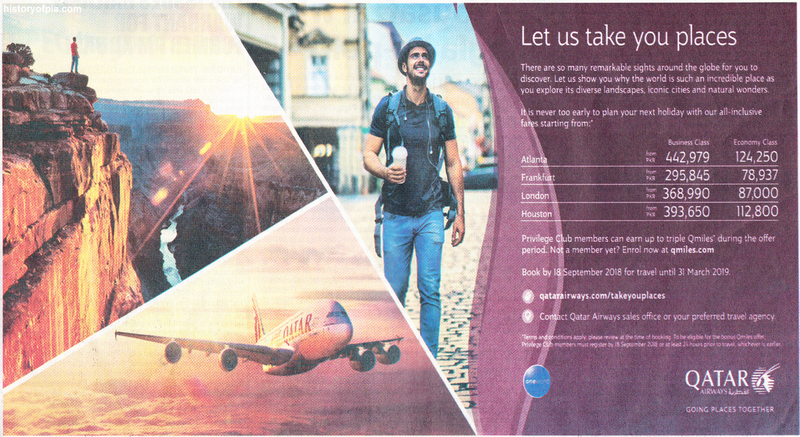 PAKISTAN: Qatar Airways is inspiring passengers to ignite their sense of adventure, or take time out to reconnect with family and friends by planning their next escape to one of the many beautiful and unique destinations the airline now has to offer. Whether you are already planning to take a trip or are still trying to adjust to reality after returning from some time away, Qatar Airways wants to take you on your latest adventure to one of its incredible gateways to the big, wide world. Passengers are invited to plan their next trip with Qatar Airways and take advantage of fantastic fares to Atlanta starting from Rs124,250, Frankfurt starting from Rs75,930 and Istanbul starting from Rs59,770. Additional offers including special rates on hotels, car rentals and Al Maha meet and greet services are available for bookings made on qatarairways.com.